Powerful easterly winds rip Rooster Rock. We have already seen one strong east wind event this fall and that event had devastating consequences for the Eagle Creek fire causing it to sweep from Eagle Creek to almost the outskirts of Corbett. As you can see in Ben’s forecast for today we are in for big east winds again today. And as Ben says we can only hope this event does not stir up the fire. First we have to look at the big picture. The first animation shows the west coast and much of the eastern Pacific. Find the center of the North Pacific High WSW of the San Francisco Bay Area. The North Pacific High is further south than it was in the summer since it has begun its annual migration to its winter time home closer to the equator. Typically in the summer the North Pacific High is more oval shaped but sometimes when a low pressure system passes to the north the NPH extends a ridge towards the Pacific Northwest. In the summer this usually means stronger west wind since we have high pressure just to our west. 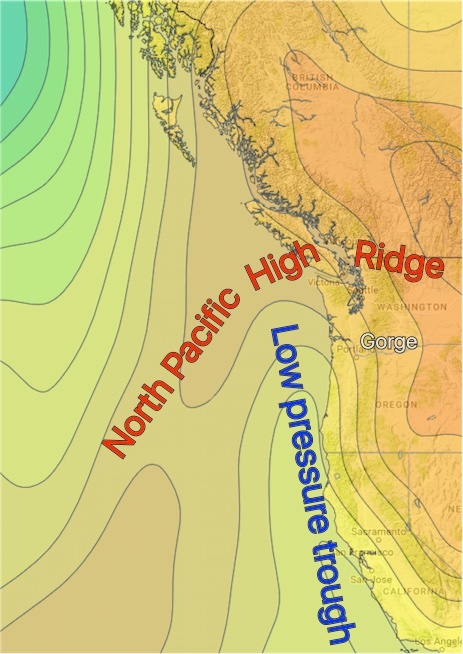 But in this animation you can see that the North Pacific High has a narrow extension or ridge that extends into eastern Oregon and Washington. And you can see the winds in the Gorge are EASTERLY. Also note the low pressure trough along the west coast. So we now have a E. to W. pressure gradient. This happens as fall progresses since low pressure systems take a more southerly trajectory and the ridge from the North Pacific High moves way inland and sometimes high pressure ends up in the Columbia River Basin out past the Tri Cities and even into the Great Basin. Hence we have high pressure EAST of the Gorge rather than to our west as we see in the summer. Now let’s zoom in and look at the isobars of the region. Picture the North Pacific High as a dome or mountain of high pressure air. You are probably familiar with topographic maps land where lines of equal elevation show you where the terrain is flat or steeper. So think of isobars as lines showing you areas of equal pressure. Where the isobars are packed closely together there is a abrupt change in the barometric pressure. And this means there is a stronger pressure gradient and hence stronger wind. The next image shows the isobars line of the North Pacific High’s surface ridge and those of the low pressure thermal trough along the coast. The orange area and the isobars around it show the high pressure from the North Pacific High’s ridge. The yellow area shows the low pressure thermal trough and its isobars. Notice how the isobars are packed most densely right around the crest of the Cascades. This is where the pressure gradient will be strongest as well as the east winds. 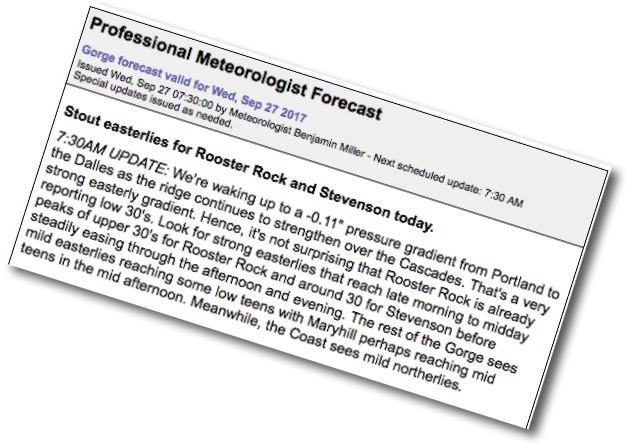 In the last animation you can see the isobars from the high pressure to the east and the low pressure trough along the coast are packed tight near the crest of the Cascades in the Rooster Rock to Home Valley region. While the corridor from Viento to out East has very few isobars. This happens because the crest of the Cascades acts as a barrier for the two pressure zones so the isobars stack up here. Also note how the isobars are only tight in morning then become further apart in the PM. This means the strongest winds are typically in the morning and early afternoon. The next question is why the winds are strongest in the morning. But that will have to wait. I am heading out now for some of that east wind.